The liver is one of the important and largest organs in the human anatomy (Body) and is essential to the proper functioning of our complete body. The liver synthesizes proteins, bile, acids, and cholesterol. it is the Primary organ which maintain balance of many nutrients and chemicals like glucose, fat, cholesterol, vitamins, and hormones and aids in the excretion of many waste products such as bilirubin, cholesterol, poison, and drugs. Liver disease is thus a serious condition that can be cured if it is cared for in the early stages. Excessive alcohol consumption over many years is a leading cause of liver disease. Too much alcohol can make a normal liver swell with fat, causing a condition called fatty liver. If the fat becomes inflamed, it can lead to either alcoholic hepatitis, a liver problem that causes serious but often reversible liver damage. Exposure to Industrial Chemicals, Toxin Substance, Aerosols and Excess Intake of NSAIDs (Pain Killer) can also Harm your liver proper Functioning. Viral hepatitis can lead to serious liver problems and is the most common type of liver disease. Hepatitis causes inflammation of the liver. The three types of hepatitis viruses - hepatitis A, hepatitis B and hepatitis C - can all be prevented. 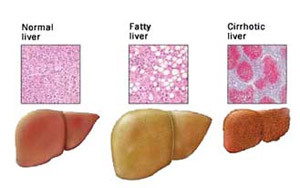 There are four stages for any malfunction of liver such as inflammation, fibrosis, cirrhosis, and cancer. The liver can get inflamed due to certain conditions, use of alcohol and certain chemicals. The conditions that can cause liver inflammation are Hepatitis B, Hepatitis C, Autoimmune Hepatitis, and Wilson's disease. Extensive alcohol use also causes inflammation of the liver. Some drugs and industrial pollutants may affect the liver. Inflammation is characterized by redness, swelling, heat and possible pain in the liver. The second stage of liver disease is fibrosis or scar tissues. After the liver has been inflamed for a long period, connective tissues of the liver accumulate. At this stage the liver functions slowly degrade. The third stage of liver disease is called cirrhosis. When liver has been damaged due to inflammation and fibrosis, it does not function properly. Accumulation of scar tissues blocks blood flow through the liver, preventing it from functioning normally. Some of the symptoms of end stage cirrhosis are edema, bruising and bleeding, jaundice, gallstones, and an increase of toxins in the blood, enlarged blood vessels, and diabetes. If liver disease is not treated in the earlier three stages, cancer may develop. Liver cancer, or hepatocellular carcinoma, affects approximately 4% of patients with cirrhosis. A liver transplant is one of the options for treating liver cancer. Early Stage Liver Diseases can be treated by taking preventive actions and Medications, Vaccine for Hepatitis A and Hepatitis B viruses are available. moreover patients should be property investigated to diagnose the disease at an early stage. Most of the times the disease is detected at an advanced stage and cure them, is not possible. NON SURGICAL THERAPY WITH THE HELP OF ENDOSCOPES IS NOW AVAILABLE IN EXPERT HANDS.